Elegant yet unpretentious The House of Sea & Sun welcomes you. This picture perfect wedding venue is quite simply a JEWEL in the heart of St Augustine Beach. Currently operating as a BED & BREAKFAST it easily converts to a terrific OCEANFRONT FAMILY RESIDENCE. Create joyful occasions and Invite your entire family to stay on the beach. A one of a kind unique offering, located amidst all the history & fun St Augustine is famous for! Host events of your choosing... Commanding 2 oceanfront lots this marvelous residence was built by Henry Flagler's niece in the early 1900's. In an era when the Rockefellers' were entertained by the Flagler family...one can only imagine what tales the walls of 2 B St could tell! Who walked, dined & danced, on these heart of pine wood floors? Join the storyA local Flagler College history professor & author reckons the fireplace mantle may even pre date the 1920's. 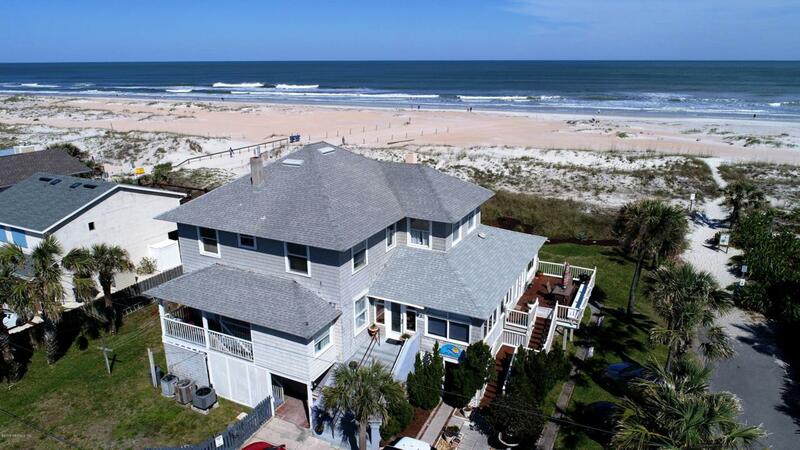 Enjoy miles of unending PANORAMIC OCEAN & BEACH VIEWS. You will be seduced onto the miles of beautiful unspoiled beach. Just a few steps and your toes will be dancing in the soft white sand. Swim, watch the surfers or dolphins dance. This 8 bedrooms, 8 full bath, 2 half bath exquisite residence will delight. Reigning on the oceanfront for nearly 100 years, this property offers the perfect escape from busy corporate life. Opportunity awaits you in this RARE oceanfront INCOME PRODUCING Bed & Breakfast. Alternatively, enjoy this beach retreat as your UNIQUE SPACIOUS FAMILY HOME that will happily accommodate your extended family and large fun filled gatherings. This jewel with HISTORICAL SIGNIFICANCE on the oceanfront needs to be seen to be truly appreciated! 10 + parking spaces and room for a garage. Schedule your exclusive showing today.